I think it goes without saying here that I’ve resisted a rather strong urge to say “how d’ya like them apples?” several times throughout this post. So at least I’ve spared you that. 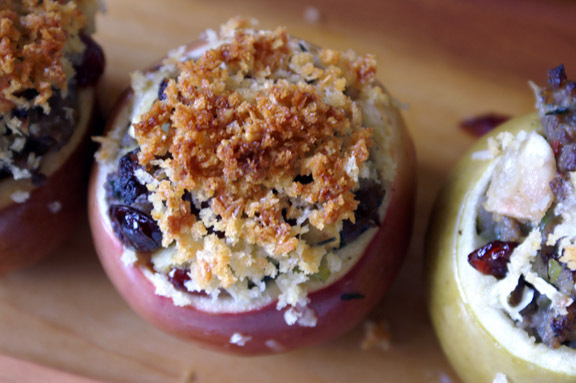 I didn’t intentionally make these Thanksgiving-like; they started out life as a very simple idea for a savory baked apple, the likes of which I’ve seen here and there while perusing the internets and my cookbooks. They always look so lovely – all burnished skin and crispy top – pitch perfect for chilly evenings. I had my doubts about if they were like this in real life, or how easy they would be to accomplish in real life, so I tried it. The family was discussing our Thanksgiving ’13 plans at the time, so these are the physical manifestation of those conversations. So I went about the business of these apples, fully aware that failure was not only a possibility, but a likelihood. I don’t have an apple corer or immense patience when it comes to certain things, so I knew I would mess these up. Turns out, I was wrong: these are actually quite simple to make, and you’d be surprised at the grace of a melon-baller when it comes to scooping apples. So don’t be daunted: pretty can indeed be easy, and these are living proof. You could go crazy with these: i just chose to stuff them with the flavors I associate with the days leading up to Thanksgiving, when all of us are gathered in the kitchen getting ingredients prepped for the upcoming feast. Sausage, celery, and onion from the dressing we make, cranberries from my favorite side dish, a little fresh sage and parsley from the turkey seasoning, and a little parmesan and panko to mimic the toasty bread crunch from dressing, but without all the heaviness and guilt. And the apples? Of course the insides of the apples are in here too, because I would never scoop out gorgeous fall apples just to waste their insides. They add a sweetness and crisp autumnal flavor that would be difficult to get from anything else. As I said, these are easy. You don’t like something? Leave it out. Vegetarian? Cool: maybe throw in some chopped Portobello mushrooms to get that meaty flavor. Everything is pretty flexible here, and can be added and subtracted as you see fit. Fear of carving apples got you down? I’ve given you pretty detailed instructions below as to how prepared the apples for filling, so get yourself a small, sharp knife and a melon baller and be prepared to wow your family and friends. You can do this. 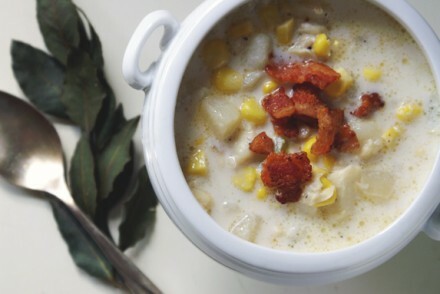 These are great for a light dinner, or lunch on a cold day, rainy day (I speak from personal experience here). They’re not huge, so think about serving it alongside a green salad with a punchy dressing, perhaps a blue cheese. If you make them sans sausage, they would be lovely alongside pork or chicken, although I suppose serving two meat things on one plate isn’t unheard of. Inspired by a few recipes I have in some of my cookbooks: Gordon Ramsey makes a sweet one, and Tyler Florence has a more savory one I saw during my research. Mostly, I used these guys for cooking times and a general feeling of how to accomplish all that is scooping out an apple; recipe is my own. *obviously you don’t need to reserve the apple cores here: I’m talking the meat of the apples. You’ll need about 1 1/2 cups of apple insides, roughly chopped, for this recipe. I would have loved to use all the apples, but if you do the math, then there wouldn’t be any room for anything else. The extra is great to snack on as you’re putting these together. In a large non-stick skillet over medium-high heat, brown the sausage, breaking it up into small pieces as it cooks. Once it is brown all the way through, transfer it using a slotted spoon onto a plate covered in paper towels to drain off the grease. Set aside. Using a sharp, thin-bladed knife, slice off the very top of the apples, right at where the stem hits the apple. Using a melon-baller, carefully scoop directly down the center, until the core and seeds are completely removed. Discard core and seeds before continuing. Use the knife to trim down the top until it’s the size you want it to be. I like my apples tall, so I made my “bowl” at the widest part of the apple. 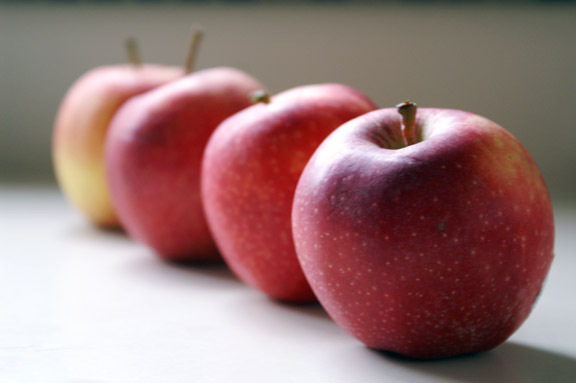 Pay attention also to how your apples sit: make adjustments to the tops accordingly. Carefully scoop out the insides of the apple with the melon baller, going slowly and paying attention. Keep your hand wrapped around the apple as you do this: it will help to stabilize things, but you’ll also feel if you begin to scoop too close to the skin. It doesn’t have to be perfect in there: leave maybe a 1/4 inch of apple, but don’t overthink it. 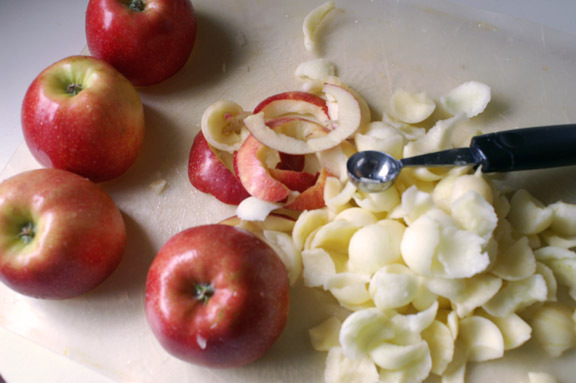 As you finish each apple, set them open-side-down on your work surface; it helps keep the brown away. 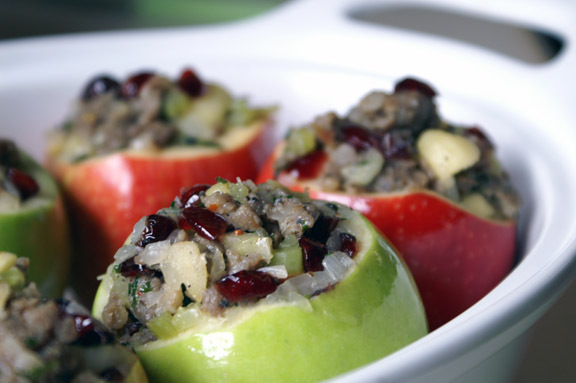 Take the leftover apple pieces and rough chop 1 1/2 cups of it to use in the stuffed apples. Eat the rest or save it for later by squeezing a bit of lemon over. Once your onions and celery are finished, add the apples and sage and cook for another 5-6 minutes until apples are soft. Add parsley and cranberries, stirring to combine. This is where I want you to season, and season well; there are lots of things in here, and baked together without proper seasoning, all these lovely flavors could lose some of their luster if not properly seasoned. Don’t be skimpy, but work carefully, adding sea salt and ground pepper, stirring, then tasting. Repeat as needed until you love the flavor, then sprinkle a little salt and pepper over top your (currently empty) apples. Preheat the oven to 400˚F. Lightly butter the insides of a deep baking dish. I used a 1.5 quart oval dish for this, but use what fits your apples the best. If you’re not sure about what will work, test a few out pre-buttering to determine which works best for you. Working one at a time, grab an apple and hold it firmly in your hand. Using a medium spoon (one which will be easy to work with and fit into the apple with no trouble), giving your filling a quick stir and start scooping it into the apple. Press firmly down as you go to send the filling to eliminate any pockets, and slightly heap the filling out of the top, making a small mound. Set in the prepared baking dish, and repeat with the rest of the apples. Stir together the parmesan and panko in a medium bowl until combined. Add melted butter and stir with a fork until ingredients are evenly coated. Using a small spoon and your fingers, lift heaping spoonfuls of the mixture up and carefully press it into the tops of your apples, pushing it gently but firmly on top of the filling; it should adhere well, but don’t be afraid to use your hands here. Once your topping has been evenly distributed, place in the oven, uncovered, and bake for 30-40 minutes, until crackly and heated. It’s a very forgiving recipe in that you’d have to basically forget about them for hours for them to be ruined, but check them at around the 30 minute mark. Your topping should be a deep golden and your filling should be hot all the way to the center. PS: Am I the only one who got a kick out of saying “baller” that many times? I know my spell check enjoyed it quite a bit. Oh yum! I made apple dumplings for my grandmother over the weekend and couldn’t get over how easy they were to make. The hardest part was pealing them. These look wonderful and will make the perfect side for Thanksgiving. I don’t think I can wait until the holiday to try the Thanksgiving Apples! 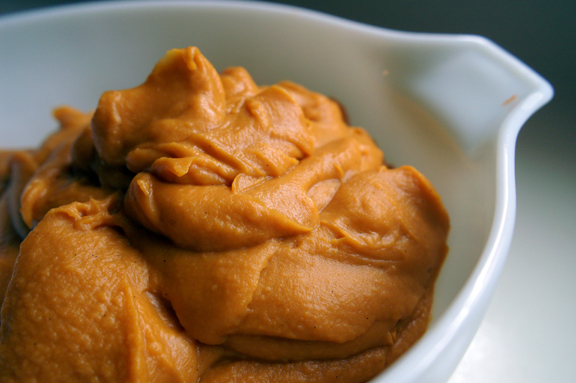 What an irresistible recipe for autumn! Oh no, you are rushing the season. But that’s OK, because these look like something I could totally go crazy over. I do like them apples! So aside from being an amazing woman, you’re like blowing my mind right now. Like, literally. I’ve actually NEVER SEEN A SAVORY STUFFED APPLE. 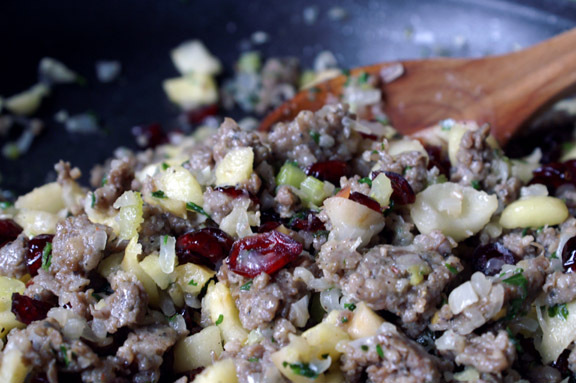 Also, this makes me want to make apple stuffing for thanksgiving, and my stuffing recipe is rather similar to what you’ve got going on here, so I think it would TOTALLY work. What’s the TEXTURE of the apple after it’s baked? I assume it softens up a bit, right? Is there still some crunch in there? Seriously. Mind = Blown. Oh and it goes without saying that these look a-freaking-mazing. True story. i love blowing your mind! 🙂 Now i want to try the sweet version, since these worked out so well. 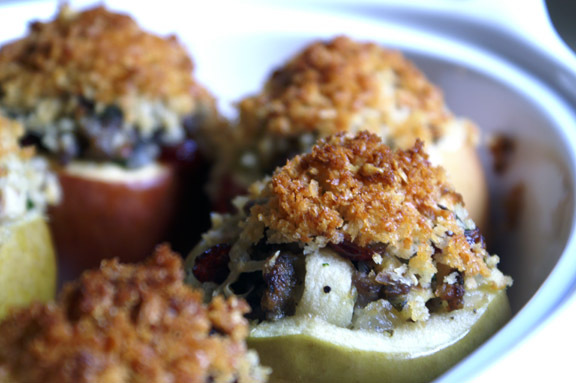 Have you ever had apples in stuffing? it’s not to be missed. We do one ever year and apples are a requirement. You summed up the texture quite nicely there: softens, but not in a mushy way, with a little bit of crunch which would vary depending on apple type. For example, the granny smiths i used retained more of a crunch than the gala apples did, but both held firm, and each imparts a different level of sweetness, too. it doesn’t hurt that these are very photogenic: like they WANT to be photographed…i didn’t have to do much; they pretty themselves up. Basically, you’ve made Thanksgiving portable. You can pick it up and take it wherever you might like. Portable food is the best sort of food, because you can lock yourself in a closet and eat it all by yourself. GENIUS. You know, if you did this right, you may even be able to eat these without utensils of any kind. So it’s the best kind of portable. Keep it away from the good clothing, though, if you are closet-bound with one: buttery. could get messy. Love it! Baked apples, whether in a crisp or in a pie or stuffed with crisp/pie-like elements (and then doused in red wine, whaaaaaa!?! ), are so perfectly fall and winter to me. So I’m beyond excited to have a more savory take. I might even convince Eric to eat them (apples = fruit = not edible to him) if I use enough sausage!!! And for the record, I applaud your restraint in not saying “how do you like them apples?” because I’m not sure I would’ve done it 🙂 Plus saying baller will always make me think of a person described in such lovely songs, never a melon baller. ha. Totally cool idea! I’ve never thought to stuff apples with sausage, but it makes total sense and I bet it’s delicious! Thank you! You know, i’ve always liked apples and sausage as a flavor combo, but it never occurred to me to stuff them either, until these. I loved them, and i can’t wait to make them again. apple picking! i feel like i’m going to miss that this year…we’ve been crazy busy and haven’t gotten out there, and i feel bad about that, because i really wanted to. next year, for sure. You were totally kidding about being “behind” because you are so on top of the seasons, Shannon! 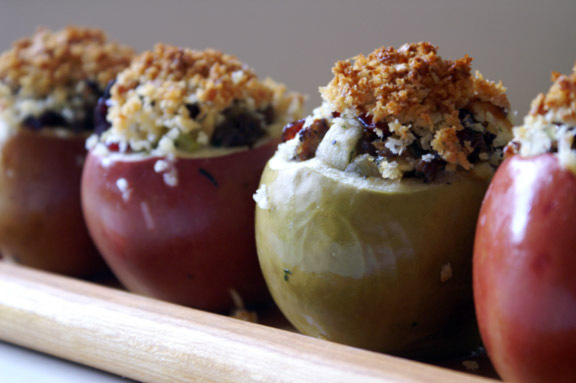 I have never had stuffed apples and don’t they look cute, like little stuffed mushrooms but totally not. This would be very impressive at Thanksgiving – or any time! FLUKE! this was total fluke, beacause i am SO behind, but these snuck in here as mostly a big experiment that managed to work; a rarity, for certain. 🙂 they’re a recipe that makes me wish i had better photo skills: they’re SO adorable in person that i found it hard to capture their true beauty on film. truly, they look even better than this in person, and you can’t beat all the crackling sounds as they come out from the oven. I do like them apples. 😉 I’ve baked apples many times, but always as a sweet, never as a savory. I’ve had them that way, just never made them. I really should – they’re quite delish. Nice recipe, super pictures. Thanks for this. ha! 🙂 I want to try them as a sweet, now, since i’ve never had the pleasure. Thank you! We do a relatively traditional Thanksgiving meal (except for the stuffed cabbage, but that is another story) with enough sides that my vegetarian daughter doesn’t go hungry. Every year I try to find something new that can stand in as her main dish. Thank you, Shannon. Using your portobello mushroom idea, I have found this year’s vegetarian main dish! Plus, it is something everyone will want. stuffed cabbage! YUM…that’s actually a personal favorite of mine, so i want to hear more about that. No one ever makes me stuffed cabbage. 🙂 Sides are (in my opinion) maybe the best part of the thanksgiving meal: i’m not a huge meat-eater either, so i make lots of sides because i like the idea of that sort of vegetable bounty on the table. Be sure when you do the portobello version to up the spices, i would say: sausage already is “spiced” to a certain extent, so adding a little extra sage and maybe some fresh thyme would really make that delicious. 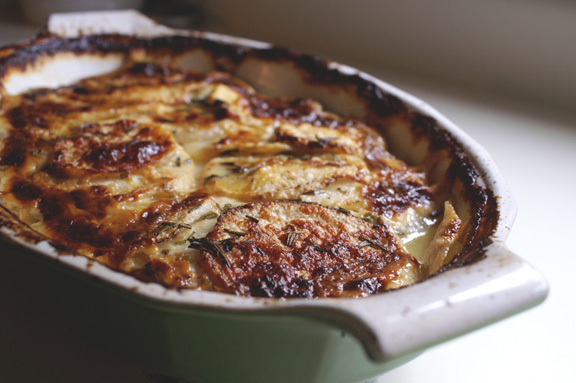 I’ve been wanting to bake things in apples lately and I love the idea of making it savory. Glad I found this while catching up with posts! There is a lack of a savory baked apple out there, and i’m surprised, given so many times growing up we had apples in savory pork dishes; you’d think you’d see more of that flavor combo out there. I’m going to attempt a sweet version soon, because all this talk about apples makes me crave the sweet, apple-pieish version. baseball phrases everywhere! 🙂 it’s totally fine: i forget to look at my blog feed for AGES sometimes, so i completely understand. I’m happy you like it! and the panko-cheese part? feel free to go heavy on it…it’s kinda the best thing ever. Two words … yes, please! I am seriously loving these apples … and you are so right … there aren’t nearly enough savory baked apples out there! Thank you! they were fun to make, and so pretty…apples are pretty awesome. I missed apple picking this year, so this is as close as i got.